Exterminate It! - Easy to use Antimalware & Antivirus. We are using a sophiisticated ANTIMALWARE engine to provide thorough scan results, which can easily beat all other products present on the market. Our database contains around 500 000 family threats both for signature and behaviour based detections. This combination - is the cornerstone of our effectiveness. Daily updates - you will stay protected even against the newest threats. The world of malware is constantly evolving, so we are constantly improving our defence mechanisms. We are keeping the rhythm - on the other side and providing protection for our customers. Submit State functionality - you will be protected even if the malware wasn't detected by our intelligent scanning engine. We are offering you our unique Submit State functionality. Professional support team. Even if your problem isn't "Malware Related" you could expect professional help from our professional support. Terrific discounts on multiple licenses packages. You can establish a cheap, but effective protection. And we are sure you will love it !!! What is Exterminate It! ? Exterminate it! is a unique, state-of-the-art application for the comprehensive detection and removal of trojans, rootkits and other malware, capable of efficiently safeguarding your PC even against the most recent and previously unknown (undetected) threats! 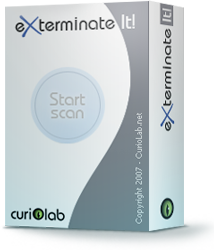 Exterminate rootkit, worms, trojans and other malware with just a couple of clicks! Exterminate It! includes the Submit State functionality, by using which you can provide us with detailed info on the state of your PC with a single click and receive a remedy for your malware problem from us in the next database update within 24 hours. Exterminate It! will help your PC stay clean - the computer security is of utmost importance in todays' business world! You can run the software when you need to, - don't waste the resources of your system. When surfing on the crest of a wave in the modern digital ocean, where everything is internet-connected, you risk falling. The Digital Ocean is much more risky than its natural counterpart. Any profit-minded criminal can be your breaking wave. Just like with real surfing, falling is also natural and hard to prevent, even if you are protected. In case you, actually, do fall, it’s really important to get immediate help. Even if you've caught the latest malware / trojan that is not yet included in our huge, daily-growing database, you will be back riding the wave within 24 hours with the help of our Submit State feature. Remember that the submission of a report on the state of your PC may help other surfers rise to their feet much faster.